Porcelana is a pretty white wash over our Medium Brushed & Burned board which gives it a fresh, light feel and creates a thoroughly modern looking reclaimed style floor that is a perfect backdrop for contemporary country or shabby chic interiors. Porcelana is created on our Cottage grade Oak which features large and small knots as well as natural colour variation. 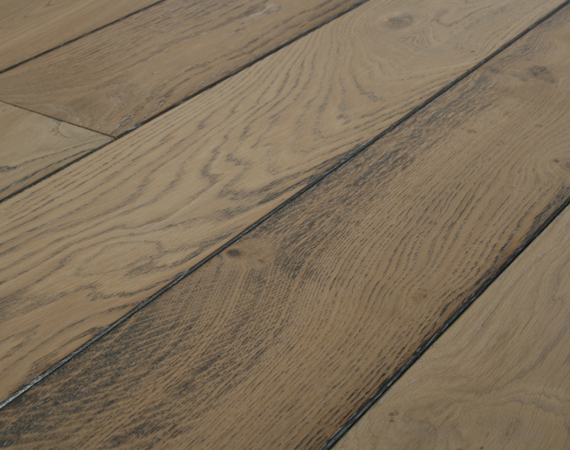 It is available on a choice of traditional solid oak or Strata, our unieuq solid oak engineered boards, in a choice of widths to 300mm and generous long lengths. Porcelana Oak flooring is fully finished with our matt satin hardwax oil, UV cured for extra durability and easy maintenance. It requires no further finishing after installation.